Bromsgrove School's under-12's netball team after defending their National IAPS title. 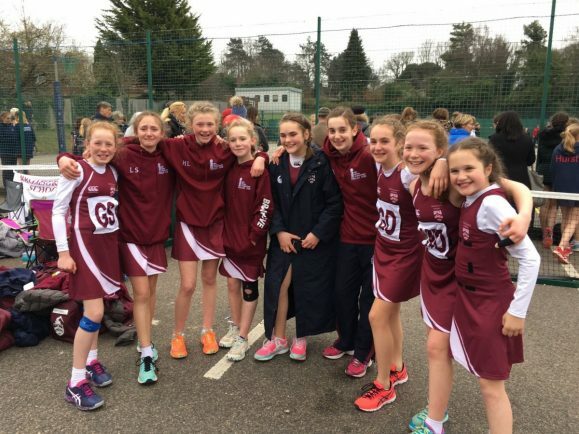 BROMSGROVE School’s under-12’s netball team have retained their crown as National IAPS champions, going unbeaten in the 2019’s tournament at Epsom College, Surrey. The side won their six group-stage matches against Taunton (9-6), a tricky contest against St Hugh’s (8-7), Clifton College (10-3), Highfield School (7-2), Downsend (11-2) and St Faith’s (7-3). Topping their group, they advanced to a semi-final match-up with Hurstpierpoint College. In a nervy game, Bromsgrove hold their composure to win 8-7 and progress to the final against St Hugh’s. Having the psychological edge of already beating them back in the group stage, the final was again another end-to-end affair, but they came away 10-6 winners to retain their crown. It is the first time that a Bromsgrove under-12’s team have managed the title since 2007 – incidentally the year most of the current team were born. Meanwhile, the under-13’s also put in a strong showing, defeating the defending national champions Farleigh School en route to finishing third and taking bronze.